Yesterday as I sat at the dining room table eating my lunch I watched the Juncos and Chickadees fighting over the suet in the woodpecker feeder and wondered why the woodpecker had never come back. I figured our greasy spoon cuisine didn’t suit him. Alas. No sooner had that thought crossed my mind than his missus showed up! I was so excited I deserted my Pad Thai noodles and ran for my camera. Of course, when I got back, the woodpecker had gone. I put my camera down on the snack bar, returned to the dining room table and resumed eating. The missus came back. I jumped from my chair and she fled again. Too much movement behind the windows. I got my camera, moved to sit closer to the window, and waited. I sat very, very still. It paid off. She returned. We know this is a lady because Mr. Hairy Woodpecker wears a bright red cap. This little lady is quite liking her cherry-walnut suet. She returned to it several times today and I’ll likely have to refill the feeder tomorrow. The store didn’t have the same flavor this week, so I am hoping she likes oats, peanuts, almonds and pecans as well — and maybe the new menu will draw Mr. Woodpecker back! We had quite a snowstorm today! About the time I was getting Amoeba’s breakfast this morning, it started to snow — huge white flakes falling fast. And sticking. You all know by now that snow isn’t one of my favorite things. By the time Amoeba was ready to leave for work, I had given him directions on how to run my errands, an assurance of my undying devotion in the face of anything but snow, and the keys to the car. I kissed him good-bye and went and got a sweater. I was staying inside where it was warm. Just think, I could catch up on my blogging! Oh well, I’ll make cookies … oh, no oven. I could read. I don’t need electricity to read and I have plenty of books to choose from. I’ll just make a cup of tea and … crap. A book just isn’t a book without a good cup of tea. I texted Thom. I talked to Amoeba on the phone. I texted my sister. I talked to my sister on the phone. I talked to Amoeba on the phone. I took a video of the hummingbird at the feeder while it was snowing like crazy (if I ever figure out how to crop it, I’ll share it). Then I saw the orange-suited power company guys in my backyard and went out to talk to them. They said they knew the outage occurred somewhere between Pear Point Road and Egg Lake. Oh goody, that’s only half the island. They told me the power would be up as soon as possible. I wasn’t cranky with them, it was snowing and cold out and I was glad they were doing their jobs. I did, however, resign myself to a long wait. Imagine my surprise when the power came back on about 15 minutes later. The guys in my backyard might nowt have known where the problem was, but obviously somebody found it and it was a quick fix. It quit snowing, the sun emerged, and all was right with my world again! One of my least favorite things in all the world is when the power goes out. I am glad it was rectified in relatively short order. Neat photo of Mrs. Woodpecker! 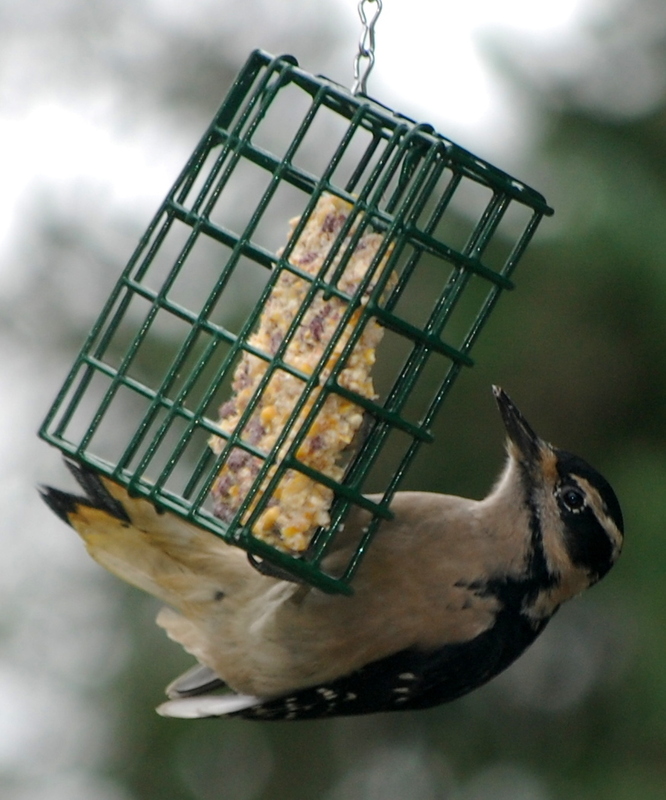 I have a birdfeeder with loose birdseed but no suet — will have to try that. We’ve been getting several visitors, and it’s funny, the ledge on it goes all the way around and could hold more than one bird at a time, but they usually take turns — or shoo each other away. Barbara — our birds are the same way! They chase one another off and no matter how many perches there are, they don’t share. well, the house finches do. They’ll get 5-6 on one feeder! Kelley — the feeder is far enough away from my window that I don’t have to worry about spotting, but they sure do splatter! We have Juncos (ground feeders) who hop around on the deck and on the ground beside the deck gobbling up everything the woodpecker spews. They love her and come on the run whenever she lands on the feeder. Oh what a great end to the day! Akelamalu — and isn’t it fun to sit and watch them? I love snow, although my car does not love to drive in it, so I am happy to stay home and enjoy it. Would you please send some my way? Very nice picture. Your patience paid off. It´s raining outside and it´s sounds like HEAVEN.